That Hudson. Eats entire loaves of bread in a single bound. 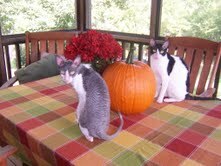 His body elongates like Gumby to reach stuff on counters. And the backyard is like a dragon's lair, but instead of skeletal remains, you'll find pizza boxes, banana peels, and chewed-on cat food cans. Once I found an unwrapped, empty, half-pound box of See's Candies upstairs. Some of the brown paper "cups" were missing, too. A website said to feed him burnt toast to help move things along. He swallowed four pieces whole. So not only does he love our food, but loves our couch. Even if every seat is occupied - doesn't matter. He'll stand there and stare down a two-inch section of open space, until someone catches on that he wants up. And then he gets all psyched-up for "the jump," which he doesn't always make. Same thing with getting down. We often find him in half-on-half-off limbo. And when we take Hudson places, we become instant celebrities. So droopy and pathetic. People eat it up. 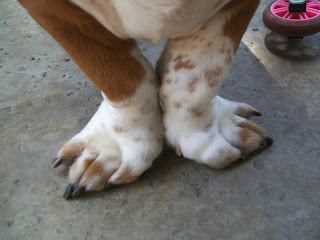 And his massive front paws - standing at "first position" - get tons of attention. Folks are forever mimicking his stance with their own arms and hands. And when Hudson meets a fellow canine at the park, it's always a little awkward. Dog owners get kind of weird and say things like, "My dog's name is Henry, what's your dog's name?" You can forget about meeting the fellow human attached to the dog. (Though, nice when I'm not much for social interaction.) Or sometimes they speak for their dog. "I'm Fifi. Wanna be my friend?" At this point I feel like I'm playing make-believe. What's next, we have them push each other on the swings? So I could go on and on about Hudson's dream sequences and cranky-old-man noises. And the whole stick of butter I once found in his mouth and how he smells like corn chips. 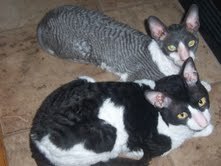 But I'll stop for now and think about which animal oddity God enjoyed creating most - my Cornish Rex cats (R.I.P. 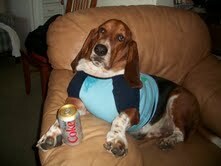 Willaby) or Hudson the hound dog? What a dog! He's like a fourth kid!